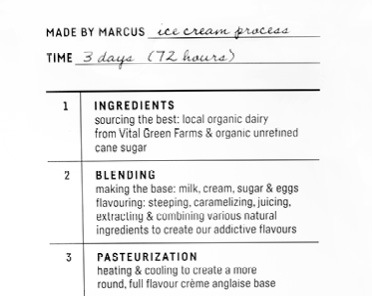 Marcus Purtzki is a nutritionist who makes ice cream. Or an ice cream maker who has a master’s degree in nutrition, depending on how you want to look at it. Either way, it’s clear within a few minutes of chatting with Marcus that he knows a great deal about good food and has a passion for the process.It’s a Monday morning and we’re sitting on metal bar stools in the 17th Avenue location, sipping on Monogram coffee and talking about Michelin-starred restaurants. It turns out Marcus has worked in a few of them. After graduating from the University of British Columbia, he was quickly hired to stage as a nutritionist in a ritzy restaurant on the Upper East Side of New York City. With stage being an industry word for unpaid internship, and the restaurant being so busy, they capitalized on the opportunity by sticking him in the kitchen. But it was actually his days off that would end up bringing him where he is today – tired of all the butchering and prep work, Marcus started making pastries on his days off just for a change of pace. His scientific mind and attention to detail were well-suited to baking, and he developed an obsession for macarons. So naturally, he decided to start a macaron business. Luckily for us, Marcus’ wife had committed to a pediatrician residency in Calgary and so the family (including the fledgling macaron business) moved here about six years ago. But as Marcus found out, when the only product you sell is made with only egg whites, you end up with a lot of unused egg yolks. Like most conundrums in life, ice cream was the best answer. Marcus began using the yolks in small batches of ice cream that was sold in the now-defunct Farm restaurant, where the production kitchen was located. Word spread of the amazingly rich ice cream and eventually retailers began asking Marcus to sell it on their shelves. And that’s what he did. The sort-of-problem was, they were selling way more ice cream than macarons, explains Marcus. The business needed to shift, but that’s not easy when you have no money. Equipment lines are not cheap, so Marcus began building credit using credit cards, then a line of credit and eventually he was able to get a loan for a storefront across the street from the old production kitchen. The Insta-famous space is small but inviting, with a beautiful wooden counter, grey beehive tiles and a row of orange mid-century modern pendant lamps. Through the glass door beyond the espresso machine you can watch the production team carefully create their standard pint flavours: cookies & cream, lemon curd blueberry, malted chocolate honeycomb, oatmeal cookie dough, roasted strawberry buttermilk, Tahitian vanilla bean, whisky hazelnut praline and wild mint chip. All in, it’s a three-day process to make, but with just one taste you’ll agree it’s worth the time. 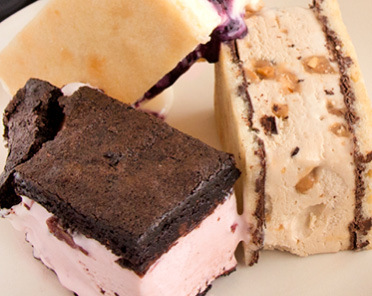 And it’s not just the ice cream that’s made in house, everything from the cookies for ice cream sandwiches to the waffle cones for scoops are made here, says Marcus. As if on cue, an employee fires up a machine on the counter and starts hand-spinning cotton candy for unicorn sundaes. 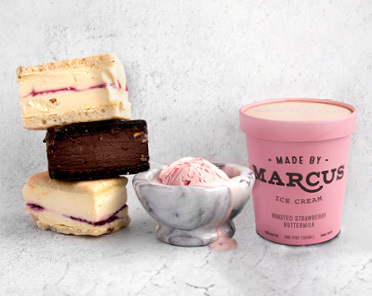 Enjoy Made by Marcus pints and ice cream sandwiches in our markets for 15% off this month and watch for new vegan pints in wildberry lavender and chocolate fudge brownie flavours! For sundaes and seasonal flavours (apple cheddar pie anyone? ), visit their 17th Avenue or new Hillhurst location.